October descends upon us this weekend. I've mentioned before that I was a sensitive youth, and that I was horribly afflicted by nightmares through most of my childhood. (My earliest memory is actually of my mother coming to me after I'd awakened, screaming, in my crib, and of the nightmare that caused me to do so. Talk about "setting the scene.") But, believe it or not, I also loved spooky tales and horror films, despite the frightful effect they always had on me. I couldn't keep myself away from them if I'd wanted to. I was a living, breathing paradox. 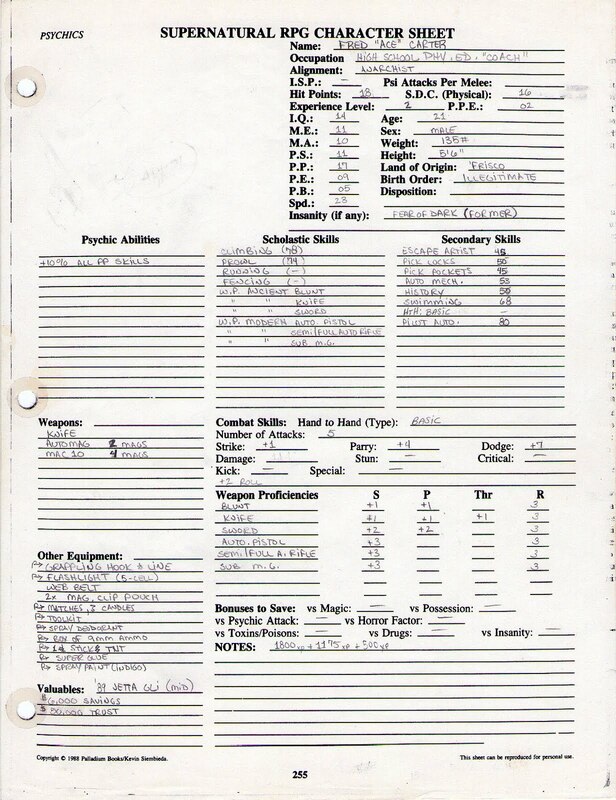 I've also mentioned before how I made my first foray into horror role playing in 1985, using a mash-up of TSR's Top Secret, Pacesetter's Chill and FGU's Villains & Vigilantes. I only got to play a couple games of this creation before I retired from playing RPGs for several years. 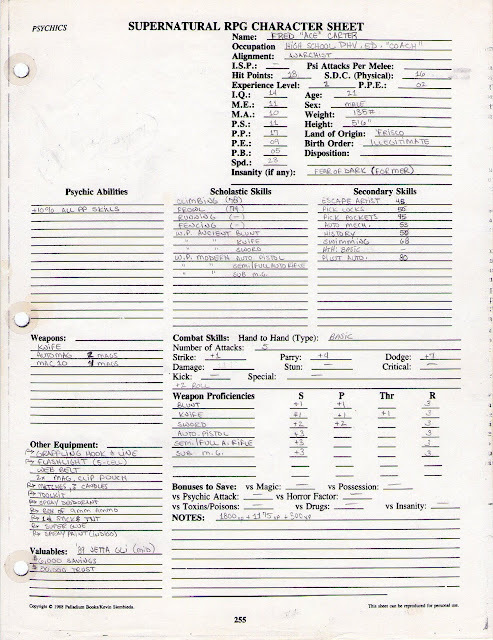 When I returned to role playing at the tail end of the '80s, it was to the old stand-by: Advanced Dungeons and Dragons. I played this with a couple of people (my later-to-be-ex and one of her friends) who were only marginally interested in gaming. They were both still in high school, and I later discovered that they had a couple of school mates who, apparently, were part of a regular gaming group. I expressed interest, and they arranged for me to run a game of AD&D for this group. The group in question consisted of the youngest brother of my childhood best friend (and someone whom I hadn't seen in almost a decade, but who would soon become my new best friend for the decade-plus to come), a guy I worked with but didn't know all that well, and couple of other guys, brothers, I'd never met. I was nervous, having never run a game for strangers before - I had no idea if it was going to flop, or - worse - turn into one of those RPG horror shows one would occasionally hear whispers of back in the day. That game was the birth of what would be - with the occasional membership change - my core gaming group for the next twenty years. But that's not the topic of this post. This post is about the foundations of my horror gaming history, which - despite that mid-eighties game - was really born with this group of people. You see, I was invited back to join that group for the following week's game. 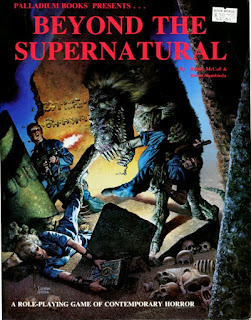 Their existing game master was going to be running a game of his ongoing horror campaign, using a system I hadn't heard of: Palladium's Beyond the Supernatural ("BTS"). This session would turn out to be the first of scores of horror role playing game sessions. 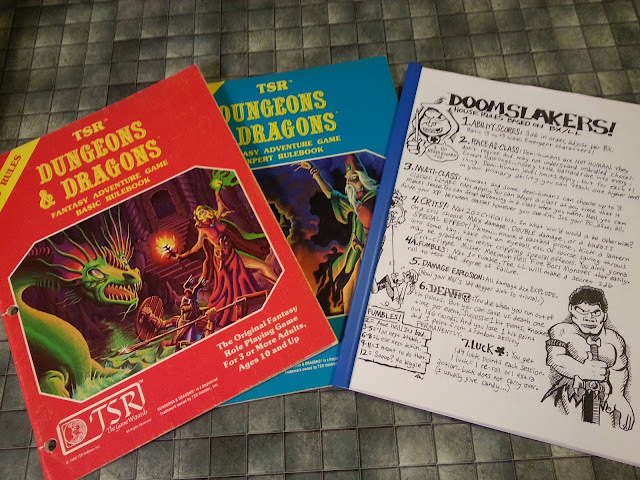 The bulk of these took place between 1989 and 1996, but the campaign setting that grew from the first games is the same setting (including characters) in which we've played as recently as last year (2015). I would have never imagined that this first step for me into an unfamiliar game system with a new group of people would spawn something that would last a quarter of a century. It still boggles my mind! And it all started with this character: Fred Carter. Yes, you read that right - his name's Fred. I suppose an explanation is in order. Here's a free tip, kiddies: if ever you get the chance to give BTS a go, steer way clear of the Genius character classes. There's not much there you can't already pull off with a smart selection of skills; the perks you get for taking the class are next to useless, and that's about what your character will end up being, as a result. In the meantime, all your fellow players will be playing super heroes. Unfortunately, I didn't have a hot tip from a hip, popular gaming-geek blogger to warn me off the class, and I compounded poor ability score rolls with a poor class choice. Followed by mediocre skill selection. Topped off by a poor roll on the background table. In short, I ended up with an average meat bag. A coffin stuffer of completely ordinary proportions. A mook. And one who had formerly been institutionalized ("All I wanted was a Pepsi, just one Pepsi.") for - get this - fear of the dark. In a game full of proto-super heroes - martial artists of profound physical ability, mages who can step into shadow and throw fireballs, and psychics who can see into the past, read minds, cause spontaneous combustion, etc., - I had a character who could walk and chew bubblegum at the same time. On a good day. But the thing is, being a total non-hero was the best thing that could have happened to the character. And to me as a player. 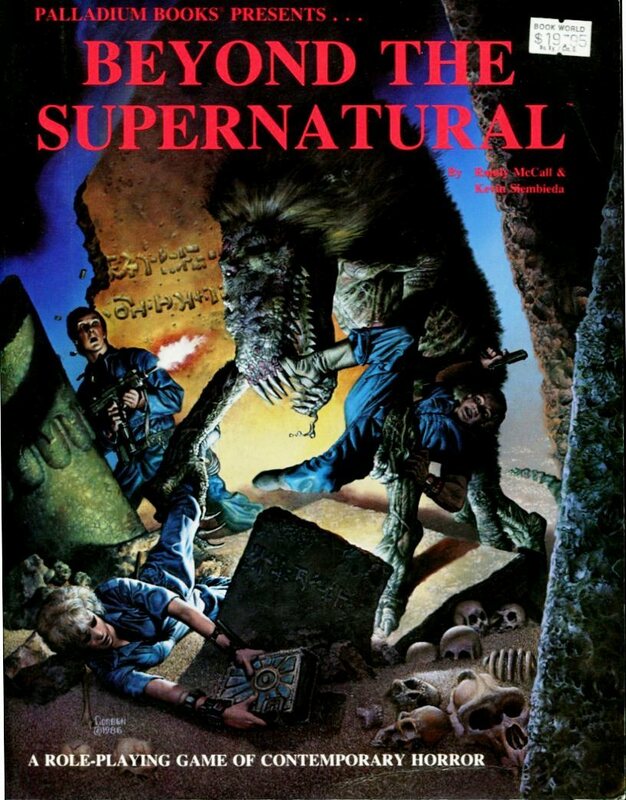 You see, while everybody else was running around finding out what the monster of the week was and how to defeat it, I got to play a character who didn't have to think, didn't have to interrogate NPCs, didn't have to read books. All Fred had to do was be the meat shield for the group's "useful" characters. For the real heroes. It was the most fun I'd ever had playing a character. Or ever would have. As time (and games) passed, I left Fred behind to try some of the other character classes available to a BTS player. I settled on a parapsychologist - Fred's uncle, I believe - who suited my intellectual side, and let me be a little more invested in the mystery behind each game session's lurking Big Bad. Before long, the group moved to playing TriTac's Bureau 13: Stalking the Night Fantastic (or simply "Stalking," as we call it). It seemed to suit us better than BTS, and we played many more horror games in that system (but with the same campaign universe and NPCs). Everybody made new characters for the game - except me. I went back to Fred. I remade Fred, and this time had better luck with my ability score rolls. Not only did he come out a little more buff (and not so ugly! ), but he rolled a high enough "PSI" score to make him an "Anti-PSI," meaning his presence made life difficult for psychic beings, and his touch drained them of their power. This made Fred the Protector even better at a job he'd already become very good at, and to this day, I revel in every chance I get to play him. Which, sadly, is next to never. So, in honor of the character I've played in more game sessions that any other, here's to Fred. Fred, the mook. Fred, the goofball. Fred, the guy who dives in front of bullets so the guy who can save the day doesn't get taken out. Fred, the guy who pisses off fellow PCs when they forget he's an Anti-PSI and try to use their psychic powers around him. Fred, the guy who punches the monster in the face and gets punched back while the witch casts the spell to banish it. Here's to Fred Carter, the coolest nobody I've ever met. P.S. 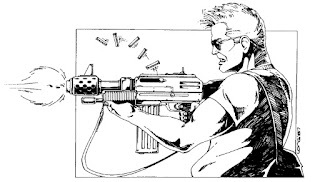 : Watch for an upcoming post in which I share the gory (not just figuratively) details of Fred's first BTS game. P.P.S. 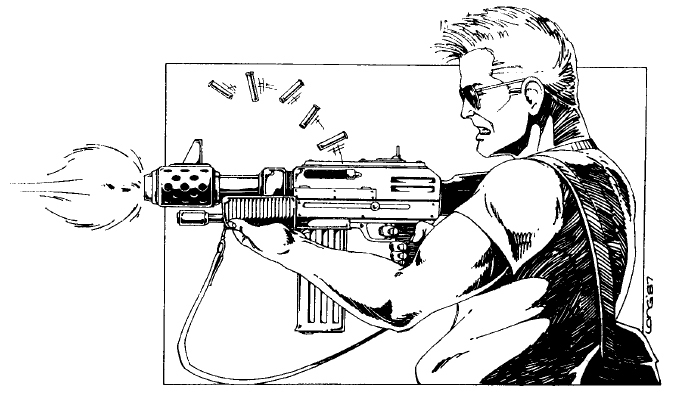 : I love Fred Carter (and his adventures) so much that I'm working on an urban fantasy novel/novella featuring him. Hopefully, the first of many. If you're interested in that sort of thing, keep an eye on my writing blog: christopherbrackett.com. *In case you're interested, I played Fred's Intelligence score of 14 like it was 9. And I played his personality as a cross between two of my all-time favorite film heroes: Jack Burton and Ash Williams (as seen in Evil Dead II - Army of Darkness had yet to be made!). He can be a little annoying (or so I've often been told) but everybody knows that when the poop hits the proverbial fan, he's all business. He leaps into danger when his friends are in trouble - with even less thought than usual - and would give up his life to defend an ally or an innocent. I figure that allows him some latitude when it comes to being a bit of a wise-cracking meathead.